Whether you need to learn how to winterize your RV, how to auto-program channels on the TV in your RV, how to operate our Phoenix Cruiser surround sound and tv, how to bake in the convention microwave oven, or the water distribution panel basics, you’ve come to the right page. 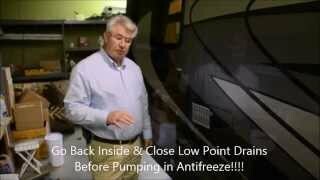 Have questions about the basics of a Sani Tank Flush (black and grey)? Want to know what makes the Sani-Con system so great? Or how to bypass the Sani-Con? We have your answers! See how to operate Phoenix Cruiser’s leather sofa bed, how to rotate the passenger seat on a Ford motorhome chassis, how to use the thermostat to set the fan speed or how to use the Phoenix Cruiser Xantrex Pro 1800 Inverter.